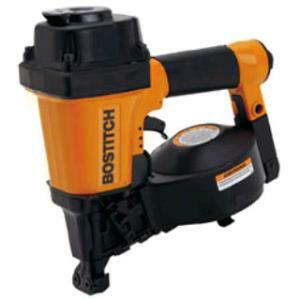 The Bostitch coil roofing nailer features durable magnesium construction design, a quick depth adjustment, and a single-action side loading canister for easy loading. This lightweight nailer comes with a 1/4" fitting, and can handle 3/4" - 1 3/4" coil roofing nails. * Please call us for any questions on our roofing nailer pnuematic rentals in Hillsdale and Ridgewood NJ.